Eschenbach is another German manufacturer of binoculars, spotting scopes, theatre glasses, meteorological instruments and eyewear. The company was founded in 1913 by Josef Eschenbach when he set up a wholesale business for optical articles and technical drawing instruments, by 1950 Eschenbach were one of the first first German companies to import binoculars from the Far East in addition to their own production of binoculars in Nuremberg. Eschenbach today are world leaders in optical precision injection moulding, high volume diffractive optics and their range of sports optics with offices in Austria, Switzerland, Japan the USA as well as others. They employ around 550 people (of these about 350 are in Germany and sell their products in more than 80 countries around the world including the UK, China and the USA. Their most well known glasses are the Eschenbach TITANflex that have a "memory metal" effect, which means that the frames quickly revert back to their original shape even after extreme deformation. 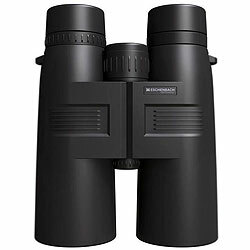 Eschenbach binoculars range from low cost take anywhere compacts to the top of the range Eschenbach farlux Selector D 8.5x45, an exceptional bird watching and nature observation binocular. Eschenbach also has a reputation for their innovative and distinctive designs, which is reflected by the numerous design awards they have received. The Farlux range from Eschenbach contains their flagship binocular, the impressive Eschenbach farlux Selector D 8.5x45 Binocular, also known as the eagle eye. Quality components are used throughout with Eschenbach's high transmission fully multi-coated optical elements known as "naturebright" and BaK-4 phase corrected high-reflection prism that give a sharp and high-contrast image over the full field of view. The Magnesium housing on the Farlux Selector D binocular also means that it is not only impact-resistant but also very lightweight. Interestingly also within the Farlux range is the selector V8 - 15x35 B zoom binocular that uses flat multi-coating and K15 and BaK-4 phase corrected, high reflection prisms that are said to produce an image which is approx. 8% brighter. This means that even at the full 15x magnification the brightness of the image remains consistent and free from "tunnel vision". All Farlux binoculars are 100% waterproof and Fogproof - filled with nitrogen to ensure there is no internal fogging in extreme climatic conditions. At the time of writing, the mid-range Eschenbach Arena binoculars consists of five roof prism models, a couple of 25mm compacts, a 32mm mid sized version, the 8x42 version and a larger 50mm Arena D+ for a 10x power with great low light performance. For more on this model be sure to read my full Eschenbach Arena D+ 10x50 B Binoculars review as I really think they are worth a closer look. The Eschenbach trophy range offer a wide choice of robust binoculars that consists of eight binoculars (5 roof and 3 porro prism) as well as a spotting scope, that according to Eschenbach are the perfect selection of binoculars for wildlife and nature observation. For me these binoculars are also ideal travelling companions, especially the compact 8x32 and 10x25 Trophy's that will make great Safari Binoculars or for activities like hiking and camping. All Trophy binoculars are 100% waterproof and Nitrogen-filled to ensure that they are fogproof as well. You can read more about Fog & Waterproofing here. 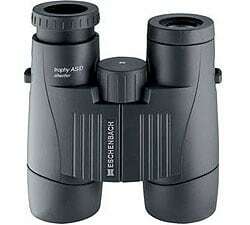 They also come with quality BaK-4 prisms and have fully multi-coated lenses. Priced between $220 and $500 / £160 - £370 depending on the model. Eschenbach advertise their Sektor range of binoculars as "Roof prism binoculars at a very attractive price" and generally I would agree, they are fairly well priced, with many features that are often only found on more expensive optics.. The range consists of 5 roof prism binoculars, ranging from the compact Sektor 10x25 Ww, to the full size sektor D 8x56 B, that makes an ideal mid priced birding binocular. 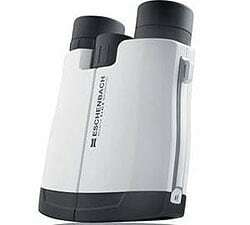 Rather confusingly Eschenbach call their full-size Sektor binoculars (8x32, 10x42 and 8x56) "sektor D compacts". 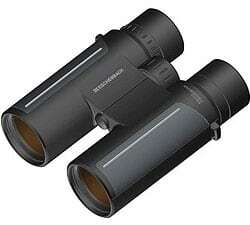 I think this is because they are more compact than their other binoculars with the same size objective lenses. All Eschenbach Sektor binoculars come with quality BaK-4 prisms and the larger versions (8x32, 10x42 and 8x56) have fully multi-coated lenses and are 100% waterproof and Nitrogen-filled to ensure that they are fogproof as well. Whilst the compact Sektor's (8x22 and 10x25) are not waterproof nor fogproof. The Eschenbach ‘adventure active’ series are marketed as rugged 'off road' all weather binoculars and they have a striking design that they say will appeal to both men and women alike! The series consists of 3 binoculars as well as a monocular and all adventure binoculars are 100% waterproof and Nitrogen-filled to ensure that they are fogproof as well. Their compact size and ruggedness, should mean that they make ideal travelling companions and therefore great safari binoculars. Quality BaK-4 prisms are used on all 3 binoculars as well as full multi-coating and they come with a protective case, carrying strap and lens cap. Like the Regatta binocular below, but not quite as radical, the Club W 8x25 B Binoculars from Eschenbach have a unique style. This binocular is designed with women in mind and these stylish binoculars won’t look out of place at Ascot, Wimbledon or even out on a country walk. Whilst it is obvious to all that Eschenbach have spent a lot of time on the styling, it does not stop there a within the impressive mother-of-pearl effect body are state of the art optics that will please even the most discerning user. 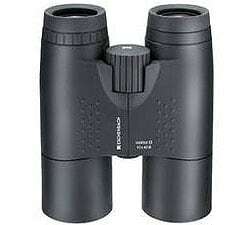 These 8x25 binoculars come with quality BaK-4 prisms and the lenses are fully multi-coated. The Club W binoculars is also 100% waterproof and has been nitrogen purged, making them fogproof as well. The Regatta binocular from Eschenbach only comes in one size, the very distinctive Regatta 8x42 B and is designed for or all leisure activities which emphasizes your individual style and I could easily imagine someone taking these to the horse races or sporting event. The Regatta is 100% waterproof and fogproof (Nitrogen-filled) You can read more about Fog & Waterproofing here. Quality BaK-4 Phase corrected high-reflection prisms are used and lenses are fully multi-coated with Eschenbach's own high transmission multi-coating known as "naturebright". 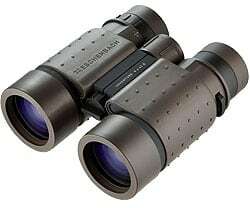 There is only one very unique looking binocular in the Eschenbach Bison range, the Bison 8x42 B Binocular. Designed for the outdoors and to blend in to your surroundings it is camouflaged to prevent any reflective or prominent surface striking the light and spooking whatever wildlife you were observing. The surface of the Bison 8x42 B features a camouflage design that was initially intended only for clothing, these great wildlife observation and hunting binoculars are 100% Waterproof and nitrogen-filled, to avoid fogging of the internal optics. 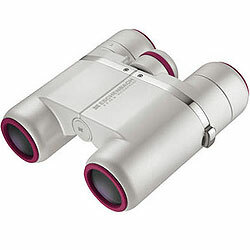 Like the other Eschenbach premium binoculars, they have their own "naturebright" coating and BK-7/Bak-4 prisms for the clearest images possible. With long eye relief for spectacle wearers they can be used comfortably for long periods with and with (out) sunglasses. The Tripod thread enables the bison 8x42 B to be attached to any conventional tripod..